A fortune teller is a really easy costume to put together – even at the last minute. You just need a blouse, a long skirt, and a bunch of jewelry. A crystal ball is a great prop, but if you don’t have one, don’t worry about it. With a few simple pieces, you can create a DIY fortune teller Halloween costume quickly and easily. You probably already have a lot of these items hanging around. Originally, we put this DIY fortune teller costume together in 2015. Since then, many items have become unavailable. We have updated this post and substituted items that have the same feel, but may look different. Links may be affiliate links. 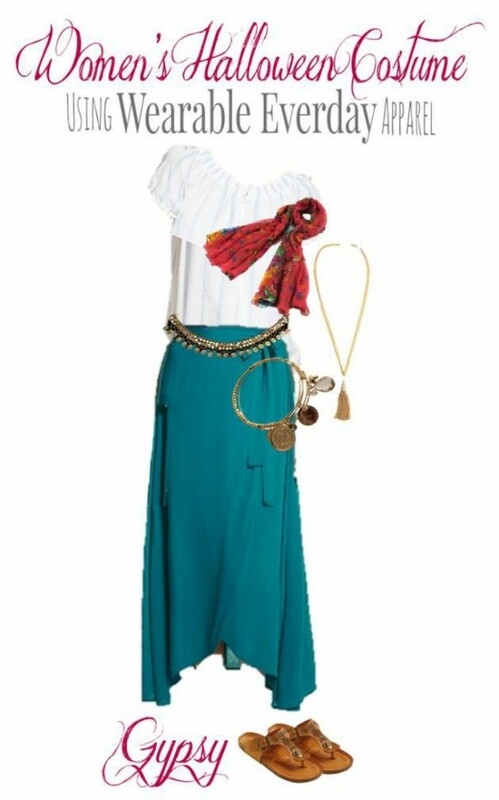 Hankerchief Hem Maxi Skirt ($40) – Every classic fortune teller has a great, flowy skirt. This hankerchief hem one is super cute. Mossimo Off the Shoulder Top ($20) – Every good wardrobe should have at least one white peasant top. If you don’t already have one, pick this one up for your costume, then add it to your wardrobe. Sam Edelman Beaded Flip Flop ($70) – These have a ton of beading and fringe, and are so fab! You’ll wear them everywhere, and they’ll last for a long time. Plus, they’re great for the costume. Long Tassel Necklace ($9) – You will seriously wear this necklace all. the. time. Such a great piece for fall and winter! 11 Piece Silver Bangle Bracelets ($10) – Who doesn’t need a great stack of bangle bracelets? These are less than $1 each, and you don’t have to wear them all at one. But ya can if you want to. Coin Belt ($12) – Because it’s TOTALLY fun! And makes noise and stuff. it’s also one of those finishing touches that really shows what your costume is. Print Floral Scarf ($10) – This is a finishing touch. it’s great as a head wrap or a belt for your costume. Plus, who doesn’t love a scarf in their wardrobe? With a few simple pieces that can easily be added back into your wardrobe, you can put together a DIY fortune teller Halloween costume. This is a great home made costume idea.